The EP25 is identical to EP15, but additionally allows tests like ECochG, ML, LL, P300 and MMN, each with dedicated filters and marking tools etc. Also the EP25 allows connection to Cochlear Implant stimulators for EABR tests. 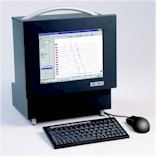 EP15/25 is a modern 2 channel ABR system in which a complete PC running Windows98 is integrated into a stand alone design. This allows for a functionality where portability and general functionality exceeds traditional PC- or laptop based ABR systems. Also all safety aspects which are often difficult to implement are taken care of effectively this way. The EP15/25 can run automatic test routines for ease of operation, and it comes with common examples already preprogrammed. Stimuli include masking, clicks and tone bursts, allowing frequency specific threshold tests. The included normative data, and the feature of automatic placement of Jewett marks facilitate the diagnostic evaluation. A database and integrated report generator is included, and the possibility to send individual sessions by e-mail or diskette for evaluation elsewhere is a highly practical feature. The extensive display control options like filtering, display gain etc. can all be manipulated after the recording has taken place and may even be handled by any workstation in a network, if the EP15/25 is run within a PC network. The EP15/25 can be upgraded with Interacoustics' upcoming TEOAE / DPOAE system. This will make up a fully integrated system for OAE and ABR. In addition to the economical saving due to shared hardware, it allows for very smooth and efficient patient handling, also for those failing a first stage OAE test.